Wash zucchini and trim ends. Grate zucchini on the large grating holes or use food processor with a grating blade attachment. Place grated zucchini in a large bowl and stir in 1 tsp salt. Set aside for 10 minutes. After 10 minutes, squeeze handfuls of zucchini over the sink to remove extra water. You may also use a cheesecloth for this task. You’ll be impressed with the amount of water you squeeze out. Add another 1/4 tsp salt, or to taste. Next add 1/4 cup chopped green onion, 1 egg, 1/4 tsp ground black pepper and give it a stir. In a small bowl combine 1/2 cup flour and 1/2 tsp baking powder, then stir into the zucchini mixture. Mix everything well. In a large heavy bottomed non-stick skillet, heat 2 tbsp of olive oil over med-high heat. 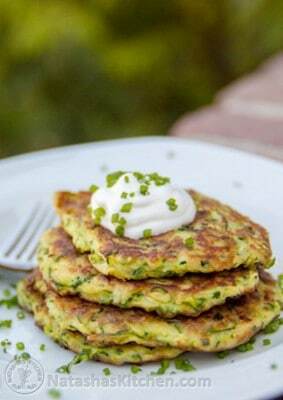 Using a tablespoon or ice cream scoop, add zucchini mixture to the skillet and gently flatten the tops with a spatula. Cook about 3-5 min per side on medium-high heat, adding oil as needed, until golden brown. If they brown too quickly, reduce heat to medium. If you like yours on the thicker side, you’ll want to pop them in the oven for 10 minutes at 200 degrees F. Place on a paper towel for a few minutes to soak up some oil.